For a show whose bread and butter is Hollywoo satire, BoJack Horseman has spent comparatively little time on the actual production of TV and movies. It’s chosen to focus on the business and the egos surrounding said business, all the people who obsess about getting roles in these projects and the little things that keep these projects from getting made. BoJack hasn’t worked in years, Mr. Peanutbutter doesn’t seem to need to work much (beyond pitching the occasional reality TV series), and while Princess Carolyn clearly moves heaven and earth to get her various clients in projects there’s rarely a need to spend time with any of those projects. But production is still a fertile ground for comedy, and “One Trick Pony” finally sees BoJack Horseman claim some of that territory. Unsurprisingly, it’s a terrific move. The blend of absurdity and pathos that the series has been gradually perfecting translates well to the hectic environment of a movie set, enough chaos and excess that events are guaranteed to spiral out of control between takes. Fully aware of the cognitive dissonance that the story engenders, “One Trick Pony” makes the ground even shakier thanks to directorial edict that all actors play themselves at all times. This produces the expected string of Who’s On First misunderstandings and miscommunications throughout the episode, characters unsure who they’re referring to or even at some points forgetting who they are. And while they’re played for laughs, they also use that connection to reinforce that the issues “Horse Majeure” appeared to solve haven’t gone away. Watts’s increasingly mad commitment to the role of Diane gets us to the root of things, first when Diane admits her wonderful wedding set her up for disappointment, and then when the “deep well of sadness” she absorbed from Diane leads her to tantric trysts with BoJack atop the craft services table. The sheer degree to which the film collapses makes Todd’s reveal that this wasn’t a betrayal of BoJack all the more impressive. Todd began the series as one of its least defined characters, and he’s since become one of its most versatile player. In “One Trick Pony” he manages to embody both sides of the episode’s strengths, its mad descent into bad idea territory and the swirling emotions that drove the whole mad caper in the first place. And in a movie set that’s steeped in the past and reminders of who and what BoJack did, he’s able to do the one thing his friend seems incapable of: move on. But Mr. Peanutbutter’s Hollywoo Heist isn’t the only thing that’s not turning out like anyone expected. The time jump of a couple of months since “Horse Majeure” means that Diane’s had the time to finish BoJack’s biography, and in the process of writing it turned into something completely different. Titled One Trick Pony, it’s less a memoir than a first-person chronicle of what spending six months with BoJack was like for Diane—and given that we’ve seen what most of those six months were like over the course of the first season, it’s not surprising the book isn’t flattering to him. Witness BoJack opening the book with wholly untempered expectations, only for his expression to collapse and have to read chapters while hiding behind the drapes. Amidst all of the lies and distractions and snacks, “One Trick Pony” does find one point of truth: BoJack and Diane understand each other better than either would admit. There’s a reason that BoJack was so quick to accept Watts’ proposal for him to pretend she’s Diane, there’s a reason why Diane’s book cut so close to who BoJack was, and there’s a reason why neither of them even tried to address the gulf that appeared between them after BoJack’s desperate kiss. And now, with two episodes to go and two words from BoJack, that relationship is this close to ending up as ash. At least there’s curated snacks. On that topic, one wonders if Netflix heard Watts gripe about being treated as a respected actress, took those satirical lines seriously, and decided to give her a Netflix drama of her own where no praise existed. Quentin Tarantulino is the most ambitious character design BoJack Horseman’s rolled out to date, and it’s an encouraging sign for future experiments. Though the mandibles affectionately working Todd’s head gave this arachnophobe the shivers. 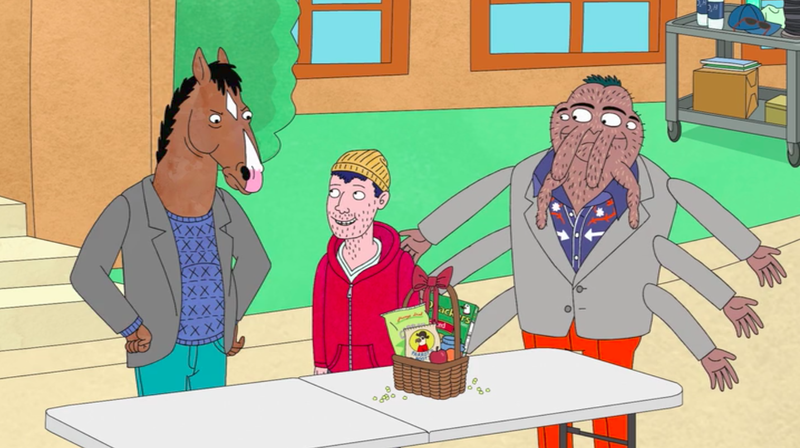 BoJack and Princess Carolyn are 100 percent right: Honeydew is garbage fruit. 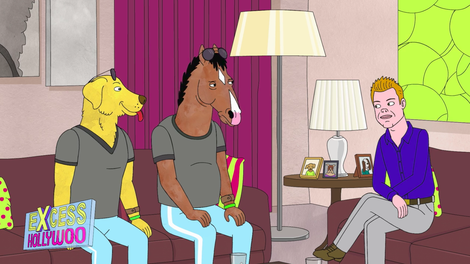 Mr. Peanutbutter’s Hollywoo Heist is the production appetizer for BoJack Horseman, as season two’s action revolves around the production of Secretariat. That production will be similarly doomed to not survive in its original format, though it’ll take a second director to get it there. Diane’s dismissal of Buzzfeed’s rating system may end up mattering in season four, with her new position as a staff writer for GirlCroosh.